When we first bought our place we walked the land, dreamed out loud, and discussed what we wanted to do. To keep our proposed big picture in mind, Dan wanted to map out how it would look some day. That's what our Master Plan is, a map of where we hope we're heading; of our goals fulfilled. It serves as a reminder of what we've decided and makes it easier to discuss how new ideas fit into the big picture. We've updated it almost every year. Now that new goat quarters are finally going to become a reality, we've been reflecting back over what we've learned over the past several years and have been discussing land usage. All of this is reflected in the new Master Plan. (To see previous plans, click here). designates what's planned. Gates are notated with pairs of dots. The biggest change (besides the goat barn) is more permanent designations for pasture and field crops. I've long hung on to the idea that we could rotate field crops and pasture in a four or five year rotation plan that utilized our critters in soil preparation. The reality of doing that has proved more challenging than I anticipated. This is partly because the odd shape of our land doesn't facilitate an easy moving around of critters. The animals themselves don't like change-ups, especially if it means being driven to different areas. It's so much easier to simply open one gate or another, depending on where we want them. This doesn't mean we can't use them in various areas, but having a more permanent setting is less confusing for them. The area we've chosen for field crops in the new plan is in a good sunny spot which has fewer weeds than "doe pasture 2" and more sun than "buck pasture 2" where I've grown them in the past. We plan to prepare it next fall for winter wheat. The placement of the new goat barn with a small fenced-in "goat corral" will make it easy to rotate between the girls' two pastures. Rotating the bucks amongst their smaller pasture areas will require a little more fencing (as in a corridor from the shelter to buck pasture 3. We may even be able to divide their pasture 1 into two for additional rotations. I also plan to make more hedgerow garden areas along fencelines between the various pasture areas. For permanent quarters, we think the pigs should be toward the back of the property. When they were closer to the house it was impossible to carry feed or hay to the goats without being accosted by pigs. They are pigs, after all! We can still give them access to whatever area we want them rooting in, so they can still have pasture, but a permanent home farther back gives us a little more control. As long as we feed them in the same spot, they'll be happy. Once the barn is done we can finish the house (only three more windows plus siding to go), including adding on a small greenhouse. That front corner of the house faces south and gets good sun in winter. The other thing we plan to do is finish fencing the rest of the property. Most of the property is fenced, except for the back "wooded, not fenced" area. There is a lot of good browse back, but the property lines are very dense with shrubs and fallen trees. It will be a big job to clear it to erect a fence. The most amazing thing with this plan is seeing how far we've come and how "little" is left to finally have the sense of being "established." 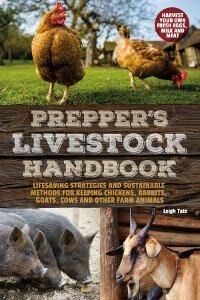 Trying to get one's homestead set up is a lot of work and there is sometimes a difficult balance amongst time, money, and our goals. Do you have a Master Plan? I'm looking for folks who do, because I'd like "How To Make a Master Plan" to be part of my The Little Series of Homestead How Tos. If you'd be willing to be interviewed for an upcoming book and see your plan in e-print, please contact me and I'll tell you what I have in mind. Nice drawing...what software do you use? I don't have a master plan per se but am a drafter by trade, worked on many industrial site plans, and have my 15 acre property laid out in a cadd program with an aerial overlay. Have used it to do some planning and recording of trail layouts. 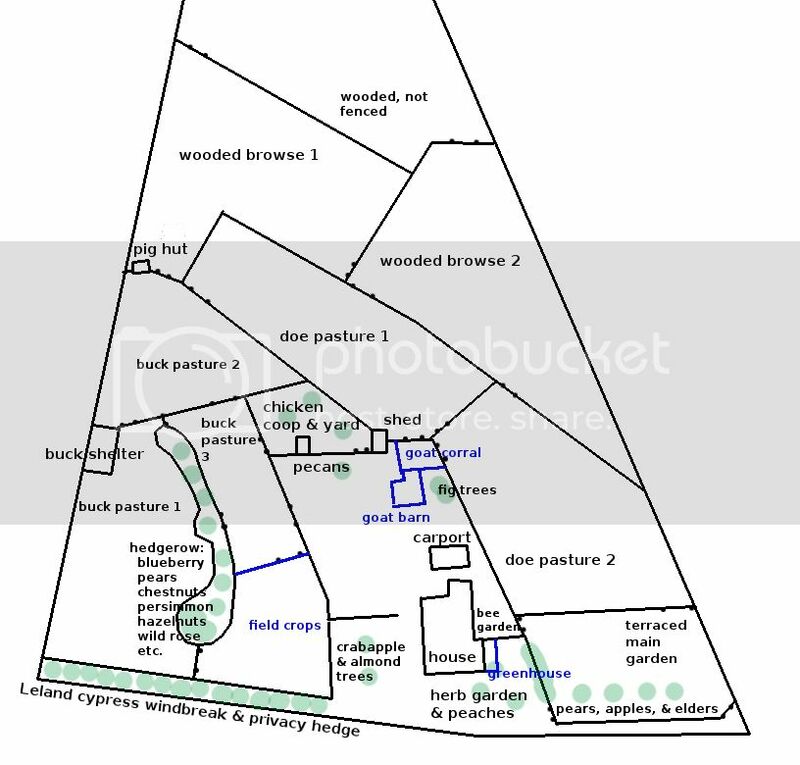 Am about to do a site plan for a friend, a 'wide view' is an invaluable tool for effective long term planning....as you have shown in browsing your annual plans. Thanks aart! For corridor I'm thinking cattle panels! I used The GIMP to make the plan. For the first plans I scanned in a copy of our survey to find placement of buildings. Then I added everything else in layers. We knew fenced areas were only approximated, however, so this time I started all over with an aerial photo, built with layers, and then replaced the photo with a plain white background to be able to read the text. I have a master plan in my head but I like that you put yours down on paper. I don't have livestock so ours is not as complicated so I can get away with it in my head. One thing about raising pigs away from constant visualization of humans. They young ones will be half feral and hard to work with. During the summer months, we always had two overflow pens on some fenced in grass(at least initially) and dirt behind the barns. Though we chored them twice a day, those pigs were always three times more difficult to work with around weaning time than their counterparts that saw us much more often. Leigh - i'm glad that you are feeling accomplished and getting closer to the goal of your Master Plan. we have a Master Plan, but as we don't have animals, it's much easier for us to do it in our heads - pick a place to build a raised bed, outdoor kitchen, extension to our existing kichen and such. this year is all about the outdoor kitchen and kitchen addition. then we have to grade and gravel our driveway. so our plans are not so much "Master" as tiny improvements. Like,Ed said....yes i keep my boar at the back of my property with access to the woods, beside it is a pen for my females to live most of the year with acess to same wooded area but separated by fence of course. Daily i let someone out into the poultry yard to graze or walk them over to the goat grazing area up front. Then i put them up first by feeding them. Have bucket will follow! Then the chickens get fed. Then i can sit down and feed my goats on the milking stand. Pigs are easiest to rotate and move around. But my goats dont mind some days going to their day area, the small area just on this side of the orchard area, or the poultry yard. Long as at night im there to lead them back to their spot. I breed for piglets once a year, and 2 weeks before shes due i walk her down to a cattle panel hut birthing area with a small dog house size farrowing box located behind our shop...basically backyard. That way piglets can have heat lamp, momma's close, and she and piglets stay in our back yard with the moveable rabbit hoop coops until weaning which then they will be sold,except for two we'll keep and grow out in the woods. I have guniea hogs and im on 4 acres. Master plans are invaluable, as long as they remain fluid as things change. My year 1 plan is drastically different from my year 6 because im still learning!!. What it does allow me is the feeling of certanity though when i know for sure this area needs to be such and such and i can confidently fence it in, like my poultry yard last summer. It has to be where it is, and it worked out, now time to plant hedgerows in that section. Love love my master plan! Good information Ed. I have to say though, that even with as much time as we spent with the pigs I never could get the piglets to do more than sniff my hand (if that), while both their parents loved to be petted and scratched. That didn't stop me from devising a way to catch them, however. I fenced off a space on the opposite side of the gate to their field. They would come on under for food and I'd block their way back. It was easy to get them loaded for buyers that way. Yes, animals certainly require a more complicated plan! But at least you have a plan, which I'm sure gives structure to your projects. The beauty of a master plan is truly their flexibility! Especially with animals, what we learn changes how we see ourselves doing things. Love that you have guinea hogs too. They are the perfect homestead breed. We are working on the initial plan...Ralph wants to know more about how the runoff goes, wind blows and land fertility is. We have what we call a basic plan of using the land, it is pretty general though. We have had to modify some things due to what we have leaned so far. I really like your Master plan and how it deals with your land. Wow! Looks so well thought out. I've a master plan scheduled to post for a while now, but its not as detailed as yours, more an overview of the land broken down into zones. I'll get that uploaded in the next few days and if its of any help to you to ask about it, you're welcome to do so. Have you considered a buck shelter in the buck pasture 3, on the chicken side? That would give you a "work lane" that might make day to day animal chores easier, and still gives access to buck areas. Never heard of that one. I use cadd for vector(so things can be drawn to scale) and Photoshop Elements for raster...both have layers, which is essential IMO. I so agree about layers. Learning how to use them opened a door for me. The GIMP is an open source photo editor; I use the Linux edition. My vector program is Inkscape, also open source. I'm not very handy with that one, however, having only used it to create a logo for my book publishing. An overview is exactly where to start and zones is good. I think there are numerous ways to make a Master Plan and the only right way is what is meaningful to you. I'll be very interested in yours and would love to include different types as examples. I think it would be helpful to folks trying to figure out what to do with their land. Actually, I would like some sort of animal shelter in almost every pasture and forage area. We've often said that the better place for the shelter would have been in the middle of that field, but we couldn't figure out how to divide it so it ended up being where it is. Live and learn! 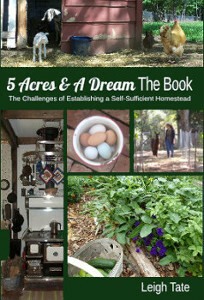 My master plan has changed quite a bit in the past 12 years as I'm learning how to develop my homestead farm. There has been an awful lot to learn! That original plan that looked so neat and orderly to us city folks in the beginning turned out not to be practical in real life. Now our farm plan is based upon environmental factors (sun, wind, water, existing trees, hills and dips, shade) and ergonomics, not some plan we saw in a magazine or book. My current master plan isn't perfected yet and I keep tweeking it as I learn more. Boy am I glad we didn't bulldoze down all the trees to create that city people's idea of the perfect farm! As a result we have 80% of the original trees still here and I appreciate them. Funny how one's ideas and priorities change over time. I think we changed for the better. I admire those with a master plan. We may venture towards it one day, but our land isn't really suitable for fencing - too many slopes. It funny how things have changed over the years though. And they will continue changing. It takes many, MANY years to set up anything useful. While we don't have a master plan as such, in my head, I have marked out "dead spaces". These are considered unproductive and in need of a radical rethink. I organise the dead spaces, which eventually connect to everything else which is more functional. What I like about this approach, is that it tends to improve my productive areas, by coming up with unconventional solutions for my dead spaces. Fix a dead space, and suddenly you find an artery to the productive areas, you never considered before. I think hedgerows are a good example of invigorating a dead zone (fence lines) which reconnects to living critters, who in turn, increase the productivity factor. Hedgerows connect the bees to a food supply and wind break, it connects the birds to a food supply and nesting area, it also connects the goats to forage and shade. Not to mention how it connects the microbes in the soil, via a living artery through the landscape. Looks great! I don't have nearly as much trouble moving my group because there are less of them. The mixed herd is used to where we live and the route I follow to graze them. It is more time intensive for me, but cheaper than fencing. My master plan for every place we have owned has always been to open up the land to the sun and keep the sturdier, marquis trees that already have a high canopy. Since we are Northeast, I always plan to pick stones and augment the thin soil as I do it. I locate the best sun and water for my small fruit orchards, whether it looks good or not. I make sturdy fords to let the water pass and the trucks drive over. This property has proven to be a challenge, but the tractor changed my achievement rate. Yesterday, some men were hired to give me some more sun. They also exposed more rocks. And so the cycle continues! I was sharing your blog and MP with a friend this am, and she noticed that your two front hedge rows would solve a problem zone for me! Ive been struggling between fruit, pasture, and a birthing hoop barn area without carving it all up with fencing. The hedgerow islands, and hotwire allow me to have it all, but changeable if needed!!! Thanks for the idea!!! That's the beauty of a master plan, isn't it? How they are adapted and changed as we learn more about our land. I had to smile when you mentioned your first ideas of the perfect farm. I've said over and over that it was a good thing we couldn't afford to do what we thought we wanted to do; we would be kicking ourselves now for it. Chris, I finally figured out that they don't call in "the slow life" for no good reason! I so agree about thinking outside the box, and it truly is our "problem" areas that force us to do that. But it takes years to learn to think differently, not to mention see things come to fruition. I have to say that our tractor has been a key tool as well. We wouldn't be making our own lumber if we didn't have it! I love how you've thought things through. No two places are the same so the goals and plans can never be the same either. Don't you just love the internet for that! Dan and I get some of our best ideas there, from others like ourselves who are problem solving while they work toward similar goals. That being said, I love my hedgerows. As Chris mentioned above, they turn a "dead" space (like a fence) into something just as useful but productive as well. What were your plans as far as shelter for the does when they are in a browse area? The pasture gate is always open when they're in the browse areas so they have access to shelter if they need it. We've thought about eventually building small shelters in all areas, but that will be awhile if ever.